Unlike others who took advantage of the long weekend (made even longer by Monday's Day of Valor), we stayed home and took advantage of the free time to bond with the family at home. When I was growing up, I used to judge those who spent holy week vacationing. My whole outlook changed when I started working. I realized that it is the longest free time you'll legally get, and that's why so many burnt out workers/employees grab the chance to go to out of town resorts and beaches. 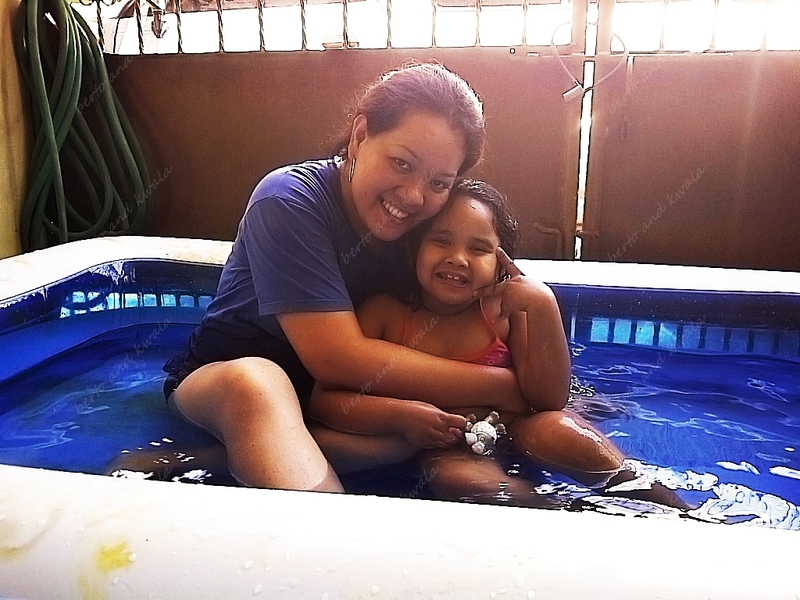 Hubby and I had a grand time bonding with the little one, who's is not so little anymore! We spent our Black Saturday morning lugging our inflatable pool to the nearest vulcanizing shop. 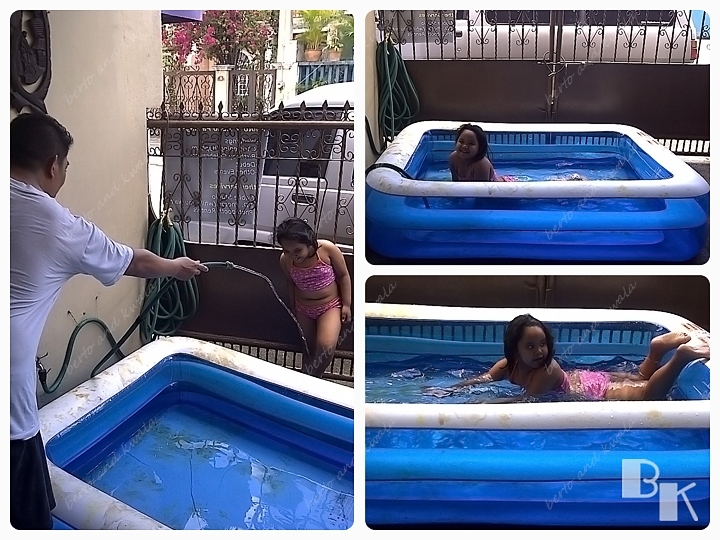 That was when we realized that our pool was so dirty and stained, it was embarrassing! haha. Apparently this is what happens when you store a deflated pool without drying everything first. Berto went to the nearest store and bought detergent and scouring pads and we tried to scrub the grime off. We were able to scrub some off but some stains were just too stuck to the plastic! Bea immediately changed into her suit, wolfed down her lunch and jumped in. 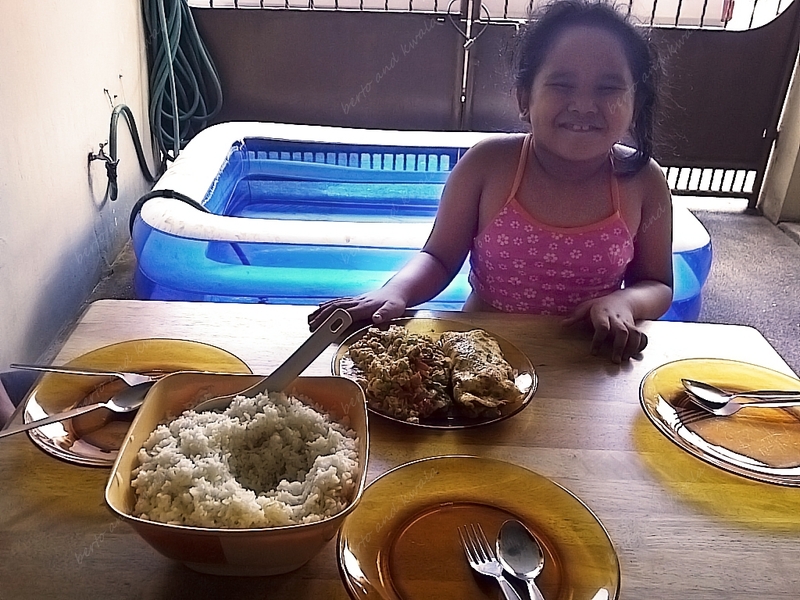 We decided to eat outside so we can watch her as she splashed in the pool, and also the summer heat inside the house was almost unbearable. We had our own little picnic by the garage. Hubby served vegetable and mushroom & onion omelettes. We had to do something with eggs (since Bea and Ninang used the shell for Easter eggs).